The self-determination of peoples is a major issue in the world community: both radical and subversive, it serves to grant statehood to oppressed peoples, but also to disrupt existing State structures. This book, the first comprehensive legal account, sets out to trace how this political ideal has turned into an international legal standard. Scrutinising State practice through national digests and UN proceedings the author pinpoints the limits within which this political postulate has gained a foothold in the body of international law and assesses the extent to which it has had an impact on existing legal norms. This is primarily a legal inquiry which, however, looks at law within its historical and political context and, given its judicial underpinning, makes an important contribution to the study of the interplay of law, history, and politics in international relations. 1. Introduction; Part I. The Historical Background: 2. Self-determination as an international political postulate; Part II. 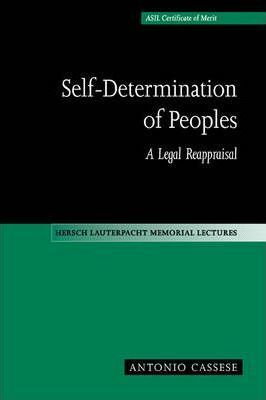 Self-Determination Becomes an International Legal Standard: 3. Treaty law; 4. The emergence of customary rules: external self-determination; 5. The emergence of customary rules: internal self-determination; 6. The holders of the right of self-determination and the means of ensuring observance of the right; 7. Comparing customary and treaty law; Part III. The Right to Self-Determination in Operation: 8. The impact of self-determination on traditional international law; 9. Testing international law - some particularly controversial issues; 10. The role of self-determination in the recent break-up of the Soviet Union and Yugoslavia; Part IV. The New Trends Emerging in the World Community: 11. Attempts at expanding self-determination; Part V. General Stocktaking: 12. Recapitulation and conclusion.